Adhesive capsulitis of shoulder. EBSCO DynaMed Plus website. Available at: http://www.dynamed.com/topics/dmp~AN~T113935/Adhesive-capsulitis-of-shoulder . Updated December 22, 2015. Accessed September 28, 2016. 5/7/2014 DynaMed Plus Systematic Literature Surveillance http://www.dynamed.com/topics/dmp~AN~T113935/Adhesive-capsulitis-of-shoulder : Kelley MJ, Shaffer MA, et al. 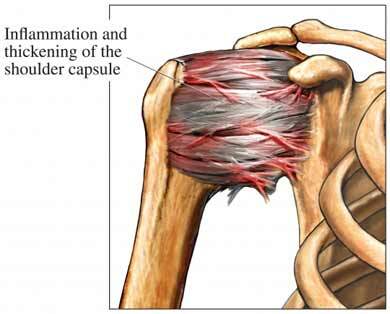 Shoulder pain and mobility deficits: adhesive capsulitis. J Orthop Sports Phys Ther. 2013 May;43(5):A1-31. 11/6/2014 DynaMed Plus Systematic Literature Surveillance http://www.dynamed.com/topics/dmp~AN~T113935/Adhesive-capsulitis-of-shoulder : Page MJ, Green S, et al. Electrotherapy modalities for adhesive capsulitis (frozen shoulder). Cochrane Database Syst Rev. 2014;10:CD011324. 1/21/2015 DynaMed Plus Systematic Literature Surveillance http://www.dynamed.com/topics/dmp~AN~T113935/Adhesive-capsulitis-of-shoulder : Chen CY, Hu CC, et al. Extracorporeal shockwave therapy improves short-term functional outcomes of shoulder adhesive capsulitis. J Shoulder Elbow Surgery. 2014 Dec;23(12):1843-1851.